I’m kind of addicted to making my own beauty products now. I have super sensitive skin, and I’m pretty picky about what I will put on it. Coconut oil is my saving grace (add another to the 101 uses list!). I use it for everything. And it so happens to make the perfect lip gloss and cheek stain, too. How many commercial blushes or lip glosses are safe enough to eat? Exactly. 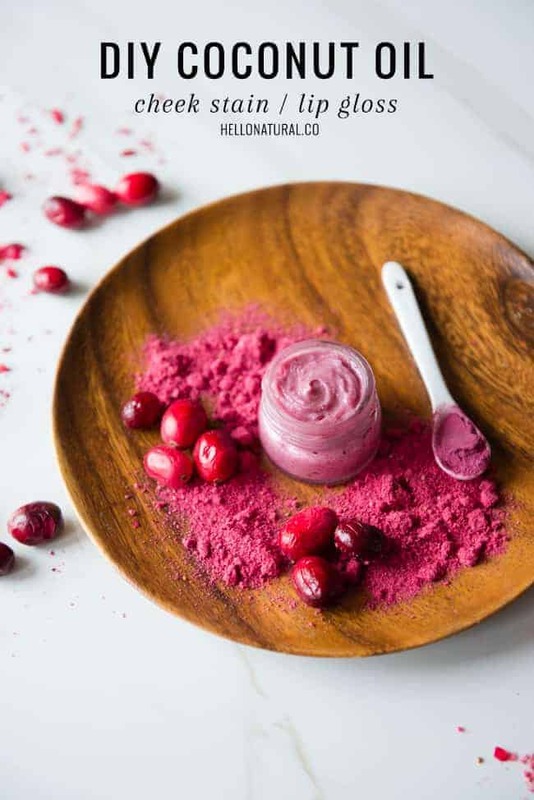 This recipe calls for four ingredients: coconut oil, shea butter, cranberry and beetroot powder. My local health food store carries both of those powders in the bulk spice and herb section. But I’ve also seen the cranberry powder at Whole Foods. (Online is another good source for both.) I have also been buying freeze-dried cranberries for a few years and they work great here too – just give them a spin in the spice grinder. Cold weather means chapped lips, at least for me. Shea butter adds extra moisturizing and a bit more firmness to the texture. It’s important to let the mixture cool before transferring to a jar. As it cools, the coconut oil and shea butter will solidify. The color might separate a little bit from the main mixture. As it cooled, I made sure to keep stirring it to keep the color particles suspended and it worked great. When it had cooled completely, I beat the mixture with a spoon to give it an almost whipped texture that was very creamy and smooth. A little dab or two is all you need for pretty cheeks and lips. In a small saucepan, melt the coconut oil. Add the cranberry and beetroot powders. Let stand for 30-60 minutes, or longer to infuse the oil. If using adding beeswax, heat the coconut oil again and add the beeswax, allowing it to melt completely. Let cool until still fairly warm, but not too hot. Strain the warm oil through a several layers of cheesecloth placed over a fine mesh sieve. Press gently on the solids to extract as much of the oil as possible. Stir in the shea butter (it should melt easily if the oil is warm enough.) Let cool. As the mixture cools, it may start to separate a little bit. Stir to keep the color particle suspended in the coconut oil. When it's solidified, gently beat it with a spoon until light and creamy. Transfer to a small jar with a tight-fitting lid. Keep somewhere cool. Will keep for several months. The beeswax is optional. 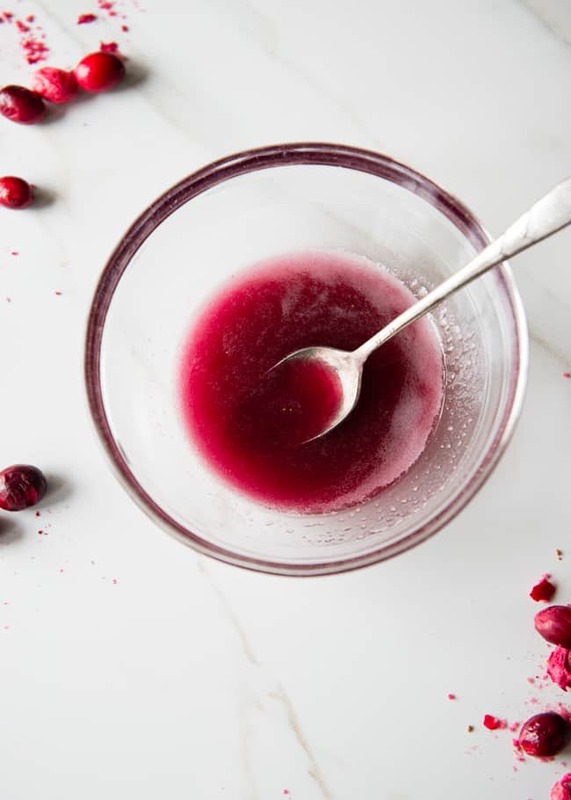 It will give the gloss a firmer texture, more like a balm.The gloss melts easily on the skin; only a small amount is needed.For a darker shade, add more beetroot powder. For a different shade, mica powder could also be added. Is this consider a all natural product? She was kind enough to post the ingredients list which you can easily see is derived of natural ingredients. Even if it wasn’t you can modify to your delight. How about don’t post a negative comment without doing some critical thinking first. Hello and thanks for this simple recipe ! So many diy are sooo complicated with many products ! Just a question though : I wanted to pu my gloss in an old lip gloss bottle, you know those tubes with a brush. Do you think your recipe would do for that or is it too creamy and thick ? Or maybe I can add just a few drops of sweet almond oil for example ; or less shea butter ? This sounds amazing! I just made some lip gloss with coconut oil too and it was so hydrating! Love the idea of tinting it! Great idea! Can I use anything instead of shae butter? I also really love this idea! Does it really work as a cheek stain? I feel like it would simple melt off or look too oily. I LOVE this idea! Can’t wait to test it out with my girls! Thanks for a very useful post…. Can beeswax be used as a 1:1 substitute for the coconut oil? 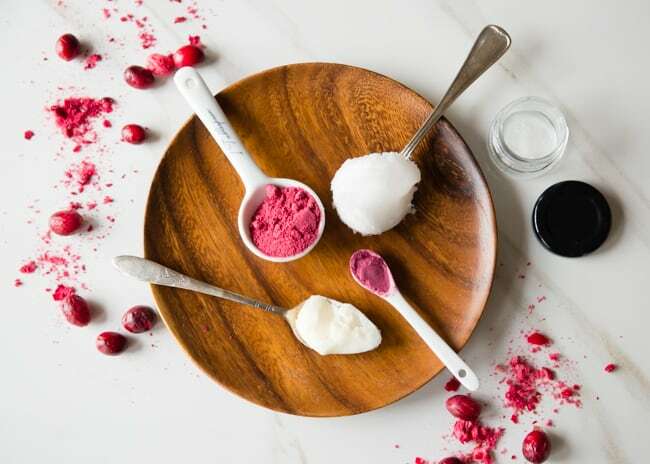 I live in a very humid climate 9and simply cannot put coconut oil on my face without breaking out like crazy) but I live the idea of DIY beauty products, especially ones that do double duty like a lip and cheek color. Ooh, ive been meaning to try my hand at some diy beauty products for a while… (After years of not really considering the ingredients in the products I put on my skin, I’ve started to question the wisdom of applying so many chemical cocktails). Reading this has made me feel more inspired to start! I was so excited to try this, and I did. But then I was so disappointed. It was very pale, and didn’t actually transfer any color to my skin at all, not lips, cheeks, lightest part of my hand, no where. I even added extra beetroot powder as recommended. I’d love to hear what you have to say. I was thinking that maybe I filtered it too much, so then I added in more beets without filtering it out again and still, no color. Also I let the coconut and powders sit for just over an hour. Another thing, when I went to rate this recipe it would only allow me to fill in “5 stars”?! Maybe it’s my computer, but somehow I really don’t think so, everything else is running normally…. That’s not cool. I had to exit out of that screen and write this all in another one just to get from having the false “5 star” rating. Did you ever get a response or get the recipe fine tuned? I’d hate to go to the trouble and have it not work. I get an allergic reaction to all commercial lipsticks and stains probably from the red dye. 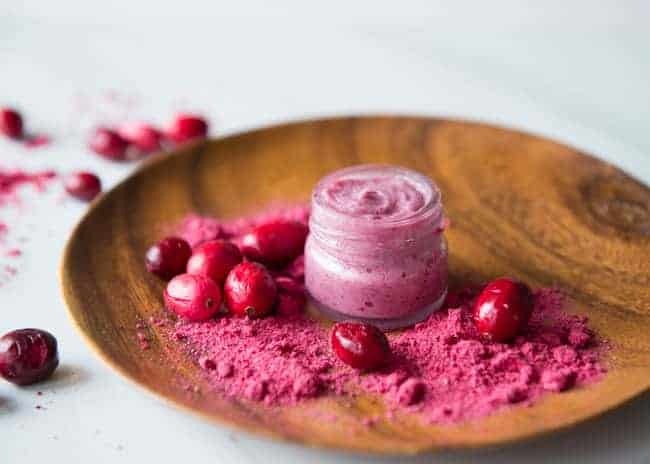 Great :) Is the beetroot cranberry powder expensive? I do have Coconut oil, but just wondering about prices. What a great idea! I stopped wearing as much makeup when I had my daughter too! Now my skin breaks out horribly when I wear any sort of foundation. I love all the natural beauty products! This is so cool! My favorite cheek stain is made with 50% coconut water, so I’m sure I would like this homemade one as well.